From The left against Europe to The break up of Britain, Tom Nairn's essays have been far-sighted and era-defining for half a century. Here, we publish the first recorded interview on his intellectual history. Tom Nairn’s influence on our understanding of nationalism is widely recognised. What is too little known is the intellectual journey that led him to be one of the few thinkers on the left to take nationalism seriously as the modern Janus, a progressive as well as regressive force. 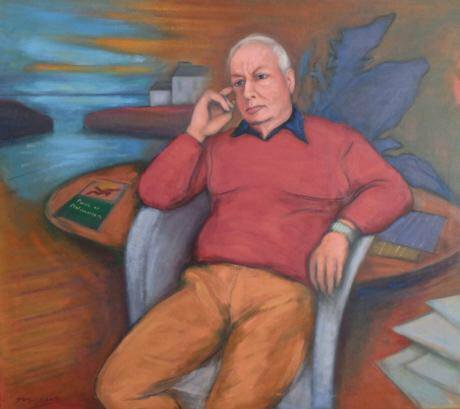 In this interview, conducted in April 2015, Nairn charts the unplanned course of his thinking from art school to aesthetics, philosophy to politics, nationalism studies to the study of globalisation, Benedetto Croce to Iris Murdoch, Antonio Gramsci to Hamish Henderson, Perry Anderson to the New Left Review. Such interests and friendships took him from Pisa to Hornsey, Amsterdam to Melbourne; yet always circling back north again. His wanderings across Europe and the globe have enabled him to see Scotland like no other observer, offering home thoughts from abroad in his inimitable prose. Will Storrar: I want to start Tom with a few autobiographical questions I've always wanted to ask. You were a teenager at the time of the 1945 General Election. What impression did the Labour victory make on you? I was too young to have views on the big shift, so what I recall chiefly was the amazement of parents and that kind of thing. The general change of atmosphere – new start, new beginning, it’ll all be different from now on, and so on. That’s what I recall chiefly, though I didn’t know at the time what to think of it. WS. By the time you went to university was it a politically lively time, in terms of politics, political clubs? Not desperately so; it was the Fifties. It was a period of general stagnation I suppose, in retrospect, though people didn’t feel that at the time. It wasn’t until the 1960s really, by which time I had been to Edinburgh College of Art [and Edinburgh University] that I was alerted to a whole new range of ideas – which in those days were very heavily influenced by one Iris Murdoch. (laughs) When I went from Edinburgh’s Department of Philosophy down to Oxford I said I was interested in the philosophy of aesthetics, and at that time the emperor of aesthetics was the Italian Benedetto Croce. And there was no one at Oxford who had much notion of his work, except Iris. So I was just put under her wing and things went on from there. And from there I just become more interested in philosophy generally, including finally political thought, political science and that sort of thing. But Iris was an invaluable intermediary in that sense. Not only was she the only person that knew anything about Croce and aesthetics, but she also had connections with the political science community, so I was very fortunate in that sense. The one obsession led on to others quite naturally in those conditions. WS. But in the chain of interests you went from art to aesthetics to philosophy and only then to political philosophy. Yes, art to aesthetics to general philosophy, and eventually of course was carried along on the stronger currents in that direction, to other people at Oxford. But Iris was a person who also enabled that, I mean in the sense that she knew everyone in those faculties and she could steer you in the appropriate direction: ‘You must see so and so, and talk to such and such.’ I remain very grateful for that kind of guidance. WS. When did you first start reading Marx seriously? Earlier, at the University of Edinburgh. I mean not through aesthetics or anything like that but just through people I encountered in other departments. Michael Hinton, for example, in the department of philosophy in Edinburgh at that time, pointed me in the direction of people who he thought I would find interesting, and of course the interest was there and finally overwhelmed me away from art and aesthetics. WS. Then you went on to teach philosophy, first at Birmingham then the Hornsey School of Art. That’s right, my interest in philosophical aesthetics took me to Hornsey, in London, where they nourished the ambition of being more than just a sort of ordinary art school. They wanted to become a kind of university-level art school. So they needed people who knew a bit more about higher things. WS. Was it at that time you met people like Perry Anderson and the New Left circle? I came into contact with New Left Review at about the same time, and it gave me a new general direction in the sense of trying to relate what I’d learnt up to that point, to wider and deeper historical currents, and that was very valuable. It happened to be Marxism, in the case of New Left Review (laughs) but I benefited from it and of course after a while came to write less about art and aesthetics. WS. Was it at this time you also encountered Gramsci and took an interest in his thought? Yes that’s right. I went to Italy originally because of the aesthetic connection. It was Benedetto Croce who made me go to Italy initially, but it was Antonio Gramsci who took me by the throat once I was there, and I became a Gramsciano at the University of Pisa. WS. Had you encountered Hamish Henderson at that time? Had Hamish talked to you about Gramsci? No, I did later when I’d been to Pisa, came back to Edinburgh and encountered Hamish, who was an Italianist of course, an established historical Italianist. He lived along the street from me and I used to see him every day. He walked in front of our living room window, and I’d shout ‘Hi, Hamish how are ye?’ And I got a broader view of philosophy and aesthetics from him because he enabled the connection between Italy and broader metaphysical and philosophical ideas. WS. But you encountered Gramsci first yourself? WS. I have a memory of sitting in the National Library in Edinburgh reading your translation of a biography of Gramsci? Yes, that was quite an important thing actually, Giuseppe Fiori's Antonio Gramsci, life of a revolutionary. WS. I’ve a memory you said somewhere you felt more yourself speaking and writing in Italian than English. That was a kind of overstatement, needless to say, which resulted from immersion over a number of years, primarily in Italian philosophy and aesthetics. You can learn to think in another language if you’re immersed enough, and in those days there wasn’t so much to read in English about all these things, so I was fortunate in that sense. WS. Was that partly your route to your openness to the idea of a united Europe at a time when the rest of your colleagues on the left were hostile to that notion? Yes, it was much more popular in Italy of course than in Great Britain in that time, and in particular on the left. Multilingua was a big thing in Italy and people in the Communist party also subscribed strongly to that direction of thought, so it put one on a limb in one sense, but on the other a limb that was intellectually fruitful, and it led me to read and imagine things that otherwise would have been difficult in the sectarian atmosphere that still prevailed in Scotland, or England, at that time. If you were a Marxist you were a Stalinist or a Trotskyist, but I was insulated against that by my Italian experience, and recognition that there was a much wider intellectual, cultural atmosphere that one could go on breathing. WS. I’m going to hand over to Scott in a moment, but I want to ask, was the invitation from Karl Miller to write ‘Three Dreams of Scottish Nationalism’ what prompted you to bring this different kind of Marxist formation – European and Italian – to bear on the Scottish question? Oh yes, that was absolutely what it was. It was an attempt to bring new cultural resources to bear on an ancient affliction, as it were (laughs), which brought two parts of my mind together in a sense, so I was very grateful. Karl and Jane Miller facilitated this quite straightforwardly through the London Review of Books. WS. Was the Scottish question always there in a subterranean way? Oh yes of course, you don’t get rid of things like that. Scott Hames: When I think of the ‘New Left’ I often think of a section of British Marxism finding its way toward culture and aesthetics via European thinkers, and you seem to have taken the opposite route – from aesthetics to Marxism via Italians. Yes, it was a completely different origin and direction in my own case, but of course the influence of the New Left Review is also unmistakable. In that period it was the most cultured, cultivated version of Marxist philosophy that was around, so I naturally found my way into it, and eventually onto the board (laughs). SH. Was there much interest in nationalism and the politics of nationhood within the ‘New Left’ at that time? In one sense too much, because of course the founders were from Ireland. I mean they were Anglo-Irish, unmistakably – English in Dublin and Irish in London. And very open to new ideas from continental Marxism, so it was quite a natural meeting of minds in that sense. SH. In those circles did you encounter much resistance to treating nationalism as a central focus and issue? Oh yes, this was normal of course, but much less pronounced in New Left Review circles than in the general intellectual climate of the Labour party, the Communist party, the Trotskyists and so on. But that was just good luck really. I mean much of the genesis of the NLR came in that way from half-foreign sources, which meant that they were just more open to ideas and to dissident ideas, because of the Irish background. WS. But Perry Anderson was interested obviously in these questions. Oh yes, he was a key figure at that time, and remains very important in all sorts of ways, and it was through knowing him and his circle in London Soho at that time, and the New Left Review group, that I was able to make the transition to a different set of ideas. SH. Could you maybe speak about how those political currents, especially of the late sixties, related to what was happening in Scotland, and the rise of the SNP in the seventies? It was something which I was conscious of having to fight for, and to give what I could of a Scottish point of view, or accent, to all that. And on the NLR board they were always too worried about Ireland. But at the same time too generally open in their mentality to refuse contributions which tried to look at the same questions in terms of Great Britain, Scotland and Wales and so on. So again I was fortunate in that way, these perspectives weren’t automatically banned. SH. There’s quite a lot of scepticism on the left about what’s happening in Scotland in that period. There’s not a lot of enthusiasm for it. Oh yes, but again I lived through that and on the whole learnt more from it than I surrendered, and that was just as well. WS. The Break-Up of Britain came out of a series of articles for the New Left Review. Did you at a certain point think there’s a book here, or did people say to you, ‘Tom, you’ve got to pull all these together’, and the whole is larger than the parts in terms of your arguments? WS. I remember reading that in the late seventies. For me it was the first book I read about Scotland that put Scotland in a European context, and in terms of wider intellectual and economic currents, in a very fresh and original way. And I think the book did that for many of my generation; say born in the fifties or into the sixties, and growing up in the seventies. It was just a different interpretation of Scotland compared with others. Yes, there was a dimensional estrangement which in fact derived from Italy essentially. Not literally but which made it more natural to look for a wider view and a different perspective on what was going on. But as you know the London intellectual milieu at that period was too abstractly Marxist. It didn’t have enough localism or colour in it, so in that sense I remained partly at a distance from it. SH. But with contacts such as Hamish Henderson you couldn’t have been too far from the kind of cultural developments of the time back in Scotland. Oh yes, I was very fortunate to live round the corner. SH. (laughs) If there was one person in Edinburgh worth knowing! Hamish was one of the few people who, as you say, lived in both worlds, and never missed his New Left Review, but also preferred talking in Italian about the contents, which we used to do in the Meadows, walking up and down Middle Meadow Walk. WS. But in the background, in terms of Scotland and culture, and Scottish identity, there was still MacDiarmid as a presence. Did that impinge on you at all? Oh yes, I found my way to it relatively easy, in fact more easily than most people on the left at that time, because of the degree of estrangement. Which worked to some degree in time as well as cultural space, and again in that respect knowing Hamish was very important. I remember going to visit MacDiarmid, in the cottage in the Borders, and discussing it with Hamish. The luck of being in the right place at the right time. SH. It almost sounds as though your point of contact with MacDiarmid, as with Henderson, was as a European Marxist rather than a Scottish Nationalist. Yes, that’s undoubtedly true. But at the same time it also helped, it was a standpoint that also insulated one from both the anti-nationalism of so many left people at that time and from bizarre forms of Trotskyism and all that. I mean I was kept in what might appear as an odd or even unique position, but on the other hand it was fortunate because I could bring different things together, and progress them in my own terms. WS. At that time too you had journals appearing like Scottish International. Did you have a sense, re-engaging with Scotland, that there was something happening culturally and intellectually here? Oh yes, I was very enthusiastic at that time and also through people like Bob Tait, who I also got to know quite well before he moved from Edinburgh. So I was able to some degree to bring together the rediscovered home environment, as it were, and the world of theory and philosophy. SH. Would you say the intellectual development you’ve described so far gave you a particular point of view on what developed around the 1979 referendum? Having this much larger frame of reference, drawing on European Marxism, did that make developments in Scotland in the late seventies look any different? It must have done, of course. And that’s why I’m very glad that I didn’t lose touch in that sense, and become a devoted cantankerous unionist like so many others. But again the form of estrangement that I’d gone through prevented me from doing that. I was already too aware of other examples, of unlikely places that made it into the forefront, and was rash enough to hope that Scots could do something similar and I’m still trying to solve the problem really. SH. One of your most lasting critical ideas, especially from that period in the late seventies, is your critique of the UK state – of Ukania and that whole constitutional tradition, sometimes viewed as irredeemably archaic, risibly feudal, and so on. One could argue that the UK constitution has changed quite a bit in the interim period. Has your critique of it changed? I’m not sure really. I mean I still think that the analysis was justified but if you move back into the present you’re still confronted with the old structure. Strong elements of it, some of the top floors have vanished but there’s still plenty of it around, and around in the form of England, really. Any fool can dream up a confederation of Britain and Ireland, you know, a ‘loose confederation’ of allied countries with or without a token monarchy – it doesn’t really matter. But all such ambitions have to accommodate the eighty percent, which is the English, and so until that shifts a bit and changes there’s not much hope of general advance. Which forces you back into a form of nationalism. I mean there’s no getting away from it, nationalism is one thing, nationality politics are another. And nationalism is fading out all over the place, but nationality politics is growing in importance. The opportunity which the Scots, the Welsh, even to some extent Belfast and the north of Ireland have is not being at the tail end of the main tidal inflow of nationalism, but being at the start of a new tide of nationality politics minus the –ism, really, and devoted to the idea of global conditions where nationality remains – and remains essential to the whole structure, but does so without the impediments of the whole age of warfare and imperialism and so on in which, inevitably, it was first produced. And I think that we’re only just discovering now what the new conditions of globalisation are going to mean. This may be a great good fortune. It may mean that development is possible on the front of nationality politics, quite differently from the earlier versions, and that’s the object of my labours these days (laughs). Trying to make a plausible theory out of this. SH. This recent collection of your writings (Old Nations, Auld Enemies, New Times, edited by Jamie Maxwell and Pete Ramand) reminds us that federalism has been mooted as a solution to the UK’s various crises for a long time, and there’s a kind of revived fashion for that today. It seems like the last best hope for the Union might be some kind of confederalism. But suppose you were today a convinced campaigner for the Union: what do you think your strategy might be? Keeping it as it is. SH. Leave things as they are. Yes. The problem is, any fool could think up a plausible kind of confederal scheme for the British-Irish whatever it is, crowned or not by the monarchy. But as long as England remains what it has inevitably been, namely four-fifths of the population, there’s no possibility of that. I mean the Scots, the Welsh, and even the Ulstermen can form a grouping of that kind without too much effort, but it’s different in England. That’s why there is no English assembly or plausible simulacrum of one. The question is raised often enough but it tends to be shrugged off by those in power, and most people in England itself, in my experience, are just not concerned enough, you know, ‘things are fine as they are, what do we want to do all this for?’ In these conditions confederation is permanently blocked. What option is there except nationalism round the periphery of the archipelago? There we are, and as yet I can see no easy answer to this blockage. SH. We’re now in the midst of a  General Election campaign unusually fixated by these issues. There was an article in the Financial Times suggesting that for the first time the impetus for Scottish independence might come from English politics – especially on the right, voices saying ‘we won’t maintain the Union at any price.’ A push from England rather than the Scots pulling away. Oh yes, well that unfortunately does look like the only, if somewhat foggy, hope (laughs). They’ll have to go that way because there’s no alternative. But that in turn is another argument for peripheral independence. I mean anyone can see that, shut out in that way, we have to do our own thing. And we do seem to be doing it (laughs). Albeit in jumps, fits and starts, it is happening. That will in turn force a larger section of Little English opinion to contemplate, ‘Well I suppose, yes, we’ll have to elect some god-damned assembly’ (laughs), you know, meeting somewhere, preferably in York.’ But again there’s no escape from Westminster really. That’s the way England is, it’ll have to be ‘London & Home Counties’ registered. But the only way that we can force that on is by doing our own thing. There’s no use grumbling about narrow nationalism, the narrowness is not inherent in nationality politics, but is forced on us by the circumstances of an un-reformable old power. SH. And you still think it’s un-reformable? SH. One thing I’m fascinated by in trying to grasp Scottish developments of the past few decades is the difficulty of connecting what seem like separate strands of all this. So on one hand we have this extraordinarily serendipitous and highly erudite world of intellectuals, writers, Marxist Italianists, who have driven the intellectual debate in Scottish politics, certainly from the pro-Independence standpoint. And then, almost from a different layer of the sediment, you have the electoral pressures and party political machinations that produced devolution. And then perhaps at another level still, you have the social mobilisation that we’re seeing now – a genuine populist nationalism. And I often struggle to find the points of intersection. It’s vital to remember the confusion about the so-called ‘Cold War’ here. The old assumption had been that this was prolonged anticipation of a Third World War; but actually it was that war itself, mercifully without resort to the deadly newer weapons of destruction. These became instead the resort of science-fiction writers. And what did emerge was a post-war realm, something like authentic ‘internationalism’ or globality. This realm now seems to be taken for granted, and part of my own, personal good fortune is to have lived on until the ‘-ism’ has disappeared, in the sense of being taken for granted. For the Scots and the Welsh this is also extremely fortunate: we took so long about re-asserting ourselves that the ancient determinants of politicised nationhood quietly disappeared. We find ourselves in a world of established diversity and variety, from which the necessity of armed struggle to ‘be ourselves’ has greatly diminished. There are still far more ‘nationalities’ than national states, with plenty of space for the latter to expand beyond the two hundred or so ‘recognized’ ones. The Greater-than-Thou States have broken up, or down, and there seems little chance of re-assertion: ‘globality’ appears to have demolished the need for them. Of course the globe still has fossils-a-plenty lying around, but also a stronger acknowledgment of what they are. Presumably nationhood can continue and multiply, and intensify, without much of the apparatus of fossildom? Let’s hope the assumption is justified! WS. Indeed. Tom, thank you for giving what Scott and I are astonished to discover is the first recorded interview on your intellectual history. And our warm thanks to Sarah Bromage from the Scottish Political Archive for making this coup possible. This is an abridged version of the interview, which will appear in full in the November 2016 issue of Scottish Affairs. Our thanks to Professor Nairn and to Sarah Bromage of the Scottish Political Archive at the University of Stirling, our hosts at a symposium on the ‘Bus Party’ referendum campaigns of 1997 and 2014.